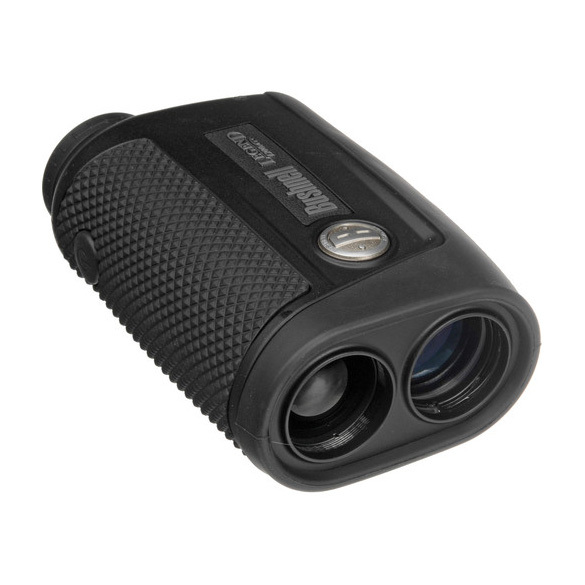 The Bushnell Legend 1200 ARC Laser Rangefinder is a sophisticated and compact monocular rangefinder that's got plenty of intelligence to help hunters and shooters use slope and bullet drop factors to accurately interpret estimated range distances. Bushnell has been at the science of slope compensation for some time now and it shows in the Legend 1200 ARC. Beyond being a premium waterproof and fogproof 6x23 monocular, the 1200 has fully multicoated optics with Bushnell's RainGuard HD external coatings. The upper finish really grabs your hand or glove. But the star of the show is the Legend's Variable Sight-In feature, or VSI for short. VSI allows the user to select sight-in distances of 100,150, 200, or 300 yards as they prefer, and shows holdover distances either in inches or in MOA (minutes of angle). Best of all, the internal slope sensor uses these choices based on an ability to sense slopes of ±90° with ±1° accuracy, which is unheard of in a consumer's instrument until now. Note! Not legal for tournament play as defined by the USGA Rules of Golf.